The Sultanate of Naqala continues to flourish. 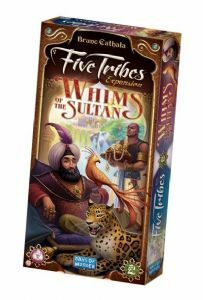 This time of prosperity has attracted more competitors than grains of sand in the desert, so if you expect to remain on top, you’ll have to learn some new tricks… especially since the Sultan founded 5 new fabulous cities that everyone wants to control. I’ve also heard that the Sultan sometimes holds hearings in those cities, offering huge rewards to those who grant him his whims. Are you up for the challenge? With Whims of the Sultan, up to 5 players can now vie to control the 5 fabulous cities and work to satisfy the Sultan’s requirements. This expansion can be played with the base game alone or along with The Artisans of Naqala expansion.